Be the first to share your favorite memory, photo or story of Everett "Tex". This memorial page is dedicated for family, friends and future generations to celebrate the life of their loved one. Everett “Tex” Hess was born on July 5, 1936 in Granite City, IL. 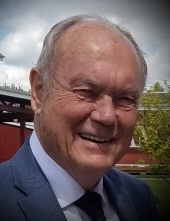 He passed away on March 29, 2019 in Coeur d’Alene, ID surrounded by his loving wife, Mary, and their family. Everett was raised on a melon farm in Illinois on the Mississippi River. He helped his father run a trap line and sold furs in St. Louis until his father passed away when Everett was 9 years old. The family then moved to nearby Edwardsville, IL. Ev had many jobs growing up such as delivering newspapers, setting bowling pins, driving an ice cream truck, and delivering mail while in college. He was an Eagle Scout and was a member of the order of the arrow. He proudly served in the US Army Reserve for 4 years. Ev graduated from the University of Illinois with a degree in business and a teaching credential. His first career was with Montgomery Ward, where he served as a District and International Merchandiser. He was later promoted to store manager in Longview, WA and in La Mesa, CA. Everett met Mary in 1972 and the couple married in Beaverton, OR in 1973. They also had a Japanese wedding ceremony while on their honeymoon. After 25 years with Montgomery Ward, Ev made a career change to real estate. Working for “Silver Cowgirl”, Ev picked up the nickname “Tex” and moved to Re/max in San Diego. Tex and Mary moved to the Northwest in 1994 and began working for Re/max of Spokane until they retired in 2011. Tex and Mary have had an amazing life together with their family and friends. They have done extensive traveling and enjoyed 46 memorable years together. They worked together for years running various businesses such as a book store, a pizzeria, a document signing business and as partners in real estate. Tex belonged to the Calvary Lutheran Church of Post Falls and the Lutheran Church of the Master in Coeur d’Alene for many years where he gained many wonderful friends along the way. Tex was always known for his Hollywood smile and charm. Having never met a stranger, he would know everyone’s story while waiting in line for a movie. Even going to the post office with Tex was an adventure, as you never knew just who would come up and give him a hug. Tex loved the outdoors and enjoyed bird hunting and fishing from Alaska to Mexico and everywhere in between. Everett was preceded in death by his parents, Christ and Florence Hess and brother Roy. He is survived by his wife, Mary; children: Dan (Kelly) Freeman, Renee (Tom) Brattain, Janielle (Dave) Hedt, Michelle (Doug) Walton, Dana Hess, Keith Hess, and honorary son, Jim (Julie) Schmidt; his grandchildren: Trevor (Joni) Baker, Zachary Julian, Marcus (Cheryl) Baker, Brittany (Ryan) Gieszler, Ashley Hess, Dorian Vasquez, Eva Brattain, Alexa Brattain, Elizabeth Hedt, Harrison Hess, Chloe Brattain, Oliver Brattain, Raphael Hess, and honorary grandson, Nathan (Karlie) Skidmore; and his great grandchildren: Ryder, Juniper, Elsie, and Savannah. A Celebration of Life will be held at 2:00 PM on Sunday April 7, 2019 at Lutheran Church of the Master, 4800 Ramsey Road, Coeur d’Alene. Donations can be made to the Schneidmiller Hospice House at www.hospiceofnorthidaho.org and the Lewy Body Dementia Association at www.lbda.org. To send flowers or a remembrance gift to the family of Everett "Tex" Dean Hess, please visit our Tribute Store. "Email Address" would like to share the life celebration of Everett "Tex" Dean Hess. Click on the "link" to go to share a favorite memory or leave a condolence message for the family.